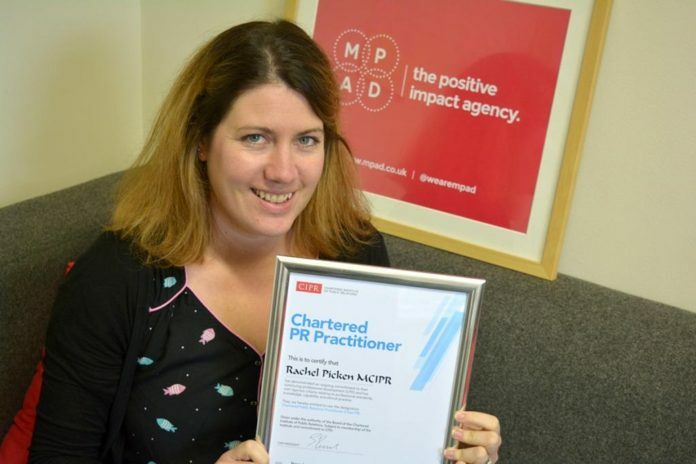 The head of Cornwall-based communications agency MPAD is one of the first PR practitioners in the UK to gain chartered status under a new assessment scheme. Rachel Picken joined eight other PR professionals at the Chartered Institute of PR on Monday (Nov 23) in London to gain the accreditation through a pilot Chartership Assessment Day. The group attended three 90-minute assessment sessions covering strategy, ethics and leadership, as well as previously completing a two-year professional development plan. The Chartership Assessment Day aims to increase the number of Chartered PR practitioners in the UK from around 50 to 250 over the next two years. Picken, who is treasurer for the CIPR South West committee and holds a CIPR Diploma, said: “We had representation from Scotland, the Channel Islands, the north east and the south west – it was a brilliant opportunity to network and share notes with my professional peers. It was certainly a vigorous assessment, but also rewarding and inspiring.